So, Thanksgiving has come and gone… You may feel full now, but Saxelby Cheesemongers suspects that you’ll have room for more noshing soon enough! After all, isn’t that what the holidays are for?! Just in time for the festivus season we’ve created a divine porcine (and bovine and ovine) holiday gift selection entitled Pasture and Pâté. Don’t know what to bring to that holiday get together? Don’t know what to send that food lover in your life for the holidays? Look no further! It doesn’t get much more delicious than this. Order one for pickup at the shop or ship anywhere in the US of A by ordering online at saxelbycheese.com! Includes one half-pound piece of savory pâté and three half-pound wedges of fine American farmstead cheese. This is what happens when pastoral worlds collide! Three rustic American farmstead cheeses meet locally produced country pâté in this unbeatable holiday gift selection. Gabriel Ross, a New York charcutier, has crafted a limited run of his sublime ‘Trotter Terrine’ specially for Saxelby Cheesemongers. Gabe’s hearty pâté is the perfect protein-laced foil to Saxelby’s selection of delectable cheese. Each Pasture and Pâté selection includes a half-pound piece of pâté, and three half-pound wedges of hearty cheese: Cabot Clothbound Cheddar, a sweet and caramelly cheddar laden with pockets of crystalline crunch, tart and tangy Landaff, from New Hampshire, a Welsh-style cheese with an earthy finish that renders it perfect for all snacking occasions, and last but not least, Vermont Shepherd, a nutty and downright mutton-y cheese with a complex, grassy finish. 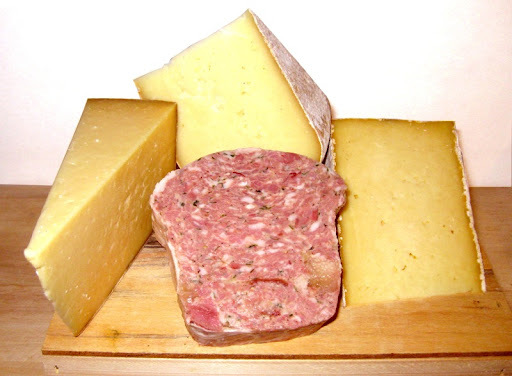 Add some delicious to your holiday nosh with Saxelby Cheesemongers’ Pasture and Pâté! Till next week, eat cheese and be merry!